Spotted in Brighton this weekend, it’s a delight to see that the Evening Argus is the first for news. One can only imagine it was a slow news day? And in other news, my namesake, former Seagulls player and Hartlepool FC boss, Danny Wilson says his team should have beaten the Albion. Glad they didn’t though, mister. 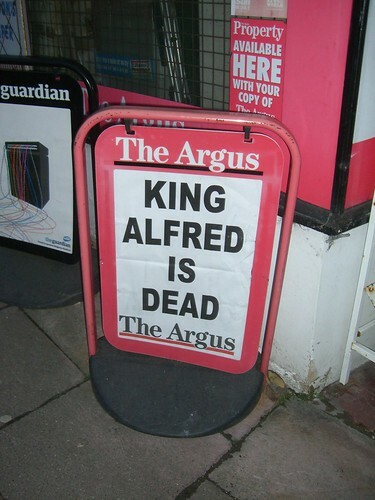 *Alas, yes I know, his headline doesn’t actually refer to the great King of Wessex but rather the redevelopment of the King Alfred Centre on Hove seafront. Pft.